There's been some discussion about online ordering of crabs, so I decided to try Reptile City. They claimed to have 2 xl/jumbo PPs for $10 (on sale) plus $30 overnight shipping. They also claimed that due to winter shipping the "overnight" package would be held for pickup at the mailing facility so as not to die on the truck, and that it would be shipped with a heat pack. So with that overnight/heat pack policy I decided to take my chances because I figured any crab would have a better chance than the poor, half-dead ones I see at the local Petco (those poor things never have a chance; I don't even know why they bother to get them in). Sure enough, on Sunday night, I got my notification and tracking number. I assumed this meant they were shipping on Monday, overnight, and that I'd pick them up at post office on Tuesday. But the email confirmation I got suggested they were being delivered to my door, and on Monday, not Tuesday. Yep, they showed up at my door at 10am Monday. I was lucky to be able to wait for them instead of going in to work. I tore open the package, the heat pack was stone cold. I rushed the two smallish crabs into the tank, where, luckily, there was immediate movement. The crabs seem fine. They came in natural shells from Florida, but both shells are roomy... the crabs have a lot of room to grow. As for "XL?" I guess that's subjective. Their claws are about 1/2" and the openings to the shells are about 3/4". They are tiny compared to my existing 4 yo pps, but not as tiny as some of the babies I've seen at Petco. I would call them "medium," certainly NOT "XL" or "Jumbo." But since Reptile City doesn't put any size measurements up on their site, you don't really have any recourse to dispute. But at any rate, they both seem to have survived the trip (I've had them 4 days and nights now) and are both eating and drinking and active at night; they don't seem overly stressed or permanently buried. Hopefully they will make it. But, I was horrified to pull up the tracking number. Not only did the shipper in Florida NOT send them overnight, she sent them USPS 2 day, and she mailed them out on a FRIDAY, guaranteeing almost 4 full days in transit! They sat there in Florida for 2 days (with a heat pack they probably didn't even need at the time) and then they hit Maryland on Saturday (heat pack dead by now), and sat god-knows-where at a USPS facility in cold DC area with 34 degree overnight temps. They arrived at my place stone cold, the package didn't even indicate that it was live animals or that there was a "this side up." As far as I'm concerned I'm lucky the crabs seem as okay as they do. It's almost a guarantee that they sat in a very cold warehouse for at least one night. I suspect that they are sourced locally in Florida (the natural shells are almost identical, in keeping with huge natural colonies like I've seen in Puerto Rico) and therefore are probably pretty healthy when they actually go into the packaging, compared to Petco shipments which can come from all over the world and who even knows what those poor things go through. This is the one good thing about ordering from Reptile City. 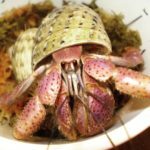 Just FYI, it is illegal to collect wild hermit crabs in Florida. All PPs are imported from other countries, and the vast majority are from Haiti no matter the source. You got really lucky with these guys but they are not out of the woods yet. Cold damage can take more than one molt to kill. Thanks for info. I won't use them again. I think they make all their money through shipping rates and only care that they aren't DOA. Fingers crossed for them and hopefully this post will dissuade people from trying this vendor. Reptile City is a company in Texas. Did you complain to the company? What city does the box say it was shipped from? itsme143 wrote: Thanks for info. I won't use them again. I think they make all their money through shipping rates and only care that they aren't DOA. Fingers crossed for them and hopefully this post will dissuade people from trying this vendor. No one makes money from shipping rates; those are literally what it costs to ship the crabs. Shipping costs go directly to UPS, FedEx, or USPS. Vendors have nothing to do with how expensive it is to mail things. SG, they charged $30 for overnight and then sent USPS 2-Day (Priority) which probably cost all of $6. Yeah, that's making a profit off shipping and is pretty common with online shopping. After reading this person's horror story, I can see now why most people don't recommend ordering crabs online. The OP's crabs were supposed to be shipped overnight, yet they ended up being re routed to Maryland and left in a warehouse in freezing temperatures that were not good for the crabs' health. Plus, the heat pack had failed. Luckily these crabs were fine once they were put in a warm tank. On top of that, they were shipped from Florida??? Not Texas? Something is definitely off there. I certainly won't ever order from Reptile City unless I want to have the same experience. crabby33 wrote: After reading this person's horror story, I can see now why most people don't recommend ordering crabs online. The OP's crabs were supposed to be shipped overnight, yet they ended up being re routed to Maryland and left in a warehouse in freezing temperatures that were not good for the crabs' health. Plus, the heat pack had failed. Luckily these crabs were fine once they were put in a warm tank. On top of that, they were shipped from Florida??? Not Texas? Something is definitely off there. I certainly won't ever order from Reptile City unless I want to have the same experience. Yep, that's how it happened. I'm okay that they were shipped from Florida. That's closer to home for them (Ft. Lauderdale... warm climate, etc) whereas anything could happen if they were actually in Texas. But to have mailed them out on a Friday using 2-day shows a complete lack of concern. Now I'm just worried that they make it through the next few molt cycles intact. GotButterflies wrote: Reptile City is a company in Texas. Did you complain to the company? What city does the box say it was shipped from? I complained to them about the shipping and his only response was, "They won't arrive DOA." Great, but they aren't out of the woods. I also showed him my review here, which now gets to stay up for posterity. wodesorel wrote: SG, they charged $30 for overnight and then sent USPS 2-Day (Priority) which probably cost all of $6. Yeah, that's making a profit off shipping and is pretty common with online shopping. Priority shipping for a flat rate box large enough to send the crabs is at least $19 (Based on the USPS website.) I sent a package of shells that weighed 4 lbs and it cost me like $17, just first class, and that was a box I supplied myself. I'm not arguing that it is crappy business practice to say you will ship overnight then use another method without customer approval, just that the cost of shipping doesn't sound outrageous based on USPS prices and what I've paid to send items out. I tend to factor in the cost of shipping supplies as well. I scavenge and reuse a lot of stuff but I know many vendors dont. A basic Priority package less than a pound (when I sent three crabs it was all of 10oz) will send in a non-flat rate box for around $7. Flat rate is a scam for lightweight boxes! And companies with business licences pay a fraction of that because they negotiate better rates. I can resolve this. The postage is on the box. It cost all of $7.45. (Wodesoral is right; flat rate is nothing but a racket.) Reptile City charges for postage scaled on when you want it (only $20 if you are willing to wait 2 weeks for shipment, $30 if you are willing to wait only a week, all the way up to $100 if you want it overnight). BUT, their website also indicates that once something ships, it goes overnight. And will be held for pickup during winter conditions, and will be expertly packed with heat packs. They also clearly don't really care, as he has made no further comment to me when I sent him this review or told him that I was horrified that shipping took 4 days.